Singapore Kid's Places: Thailand here we come! We are heading to Thailand in a few days for the kids' Easter break, and we are all very excited. Martin has been working hard and will be travelling a lot for work this year so really needs this break with us to prepare mentally and physically. For a lot of people he has a job made in heaven (sports journalist/editor) but in reality the weeks away on assignment can be pretty tough, especially for a born family man! I know he misses the kids a lot (and me a little??) so this holiday will a chance for us to have some fun together. Anyway, we have been to Phuket a few times and wanted to try somewhere different this time. The kids are old enough to enjoy getting a bit wet jumping on and off the longtail boats, so we have decided on a little island hopping from Krabi. 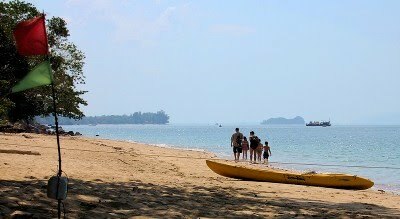 We are flying to Krabi (first time) and heading to Ko Ngai, on my sister's recommendation, Ko Lanta, and lastly Ko Jum. We found this resort, Ting Rai Bay Resort on Ko Jum, on the internet and it looks divine. A lot of the operations on this island were damaged by the tsunami, but these huts are situated on a steep hill so only the beach bar and four chill-out huts were destroyed. 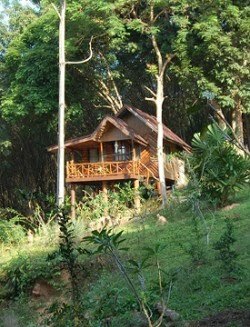 All the same, the bungalows all look new and well looked after, and we have a deluxe family bungalow for only S$56 a night! There is nothing much to do here except swim, snorkel, read, eat, and sleep, which sounds perfect to me! Here are some photos of Ting Rai Bay Resort for you to enjoy; looking at them makes me take in a deep breath and feel more relaxed, so can't wait to dive into that water. How's the political situation there? We're planning to go Phuket end of May, but my husband & mom are both very concerned about possible riots & wanna cancel the trip! If you are traveling direct to Phuket I can't see a problem. Keep an eye on the situation, avoid Bangkok and have a great holiday! I like to live in the bungalow. So cheap and nice. I'll try it next time. Thank you for sharing!